Inspiration takes so many forms! It is our cherished relationships that celebrate life’s journey and sustain us in our times of challenge. As heirs and stewards of our family history and treasured memories, it is up to us to pass those values from one generation to the next. The arts of quilting and cooking have long sought to reinforce that while life is precious and fragile, the thread that connect us is vibrant and strong. It is the simple things that keep life rich and comforting, and they fill our days with sharing and support. Certainly recipe sharing is one of the warmest gifts of love. Throughout the generations the gesture of sharing has served to unite and connect families and friendships. The recipes shared represent the simple beauty, legacy, culture, and colorful personalities that connect us through time. They are indeed an eternal patchwork of memories of the people and places we hold dear. The images of handmade quilts are also marvelous treasures of beauty and warmth. They symbolize that our relationships form beautiful patterns of home, hope and heritage. The talent and artistry of quilters reflect these treasured values through the use of colors, tedious workmanship and infinite patience. 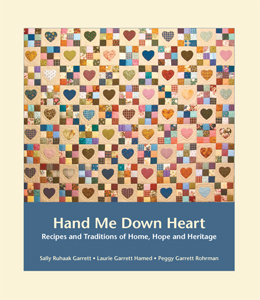 Hand Me Down Heart is an endeavor to honor the generations of family and friends with recipes, anecdotes and pictures which are lovingly entwined with memories of precious home, heart and heritage. May you embrace these gifts, revel in the delight of a shared experience and find your life’s inspiration!